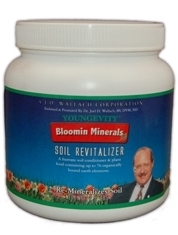 "Try my Bloomin Mineral Plant Food, Your Plants will love it!!! Same Raw Material Colloidal Minerals are made from. Bloomin Mineral is a 100% natural humic soil conditioner. Composed of prehistoric plant minerals no longer found in farm and range soils. No Binders or Fillers added. High organic matter and humic acid analysis. 75 major, trace and rare earth elements. Increases water retention and penetration. Improves soil physical characteristics. Apply to established lawns and gardens at rate of 12 lbs. Per 1000 sq. ft. for new lawns or garden apply 12 lbs. per 1000 Sq. Ft. And mix or till into the soil before planting. 1 tsp. for 1 qt. house plant. Whether you're a home gardener, professional nursery keeper or agriculturalist, you will find that Bloomin Mineral is the best product for all your planting needs. Senate Doc#264 explains the root of the problem facing America's soils.